Still don't know where to apply? It’s impossible to write your college application essays and supplements if you don’t know where you’re applying. There are so many choices — and so many unknowns — that students often have a tough time settling on their lists, even if they’ve visited every campus. Don’t panic – there’s help right here. There are two excellent sources of valuable information if you’re still uncertain about your final list: College Niche – a website – and The 2019 Best 384 Colleges, published every year by Princeton Review (no connection to the university of the same name). If you go for the book, the 2-page overviews offer great information in the text and sidebars. You can read about what’s important in admissions, student comments, the vibe, the study scene, the most popular majors, and — my favorite — ratings in the lefthand sidebar for PROFESSOR INTERESTING RATING and PROFESSOR ACCESSIBLE RATING. For example, for PENN STATE, those numbers are 80 and 83. For HARVARD, 64 and 61, and for HARVEY MUDD 98 and 99. In case you want to know whether you’re likely to have much of a relationship with your professors. Another favorite place for online college information is College Niche, which has become a serious resource in recent years. It’s free, though you need to sign up after a search or two, and it includes ALL colleges and universities, not just “the best.” It presents reviews broken down by category, detailed financial information, admissions information, a scattergram that will help you see if you’re a good candidate, AND you can search colleges by state and get an entire list in seconds. But there are a few tricks to getting the information you want. Scroll down all the way to the bottom for REVIEWS, and click on ALL CATEGORIES to see the list of how reviews are broken down – by ACADEMICS, CAMPUS, SPORTS, etc. and click on the topic you want, or stick with ALL CATEGORIES. As you read student reviews, read many of them, not just a few, because you don’t know who these people are and what you might have in common with them – or not. But if you read enough reviews, I think you can get a flavor of the student reactions. Most colleges Early Action and Early Decision deadlines are November 1 and November 15. Regular decision is usually – but not always – January 1. There are many opportunities now for ED 1 and ED 2. Check with each college for specifics. 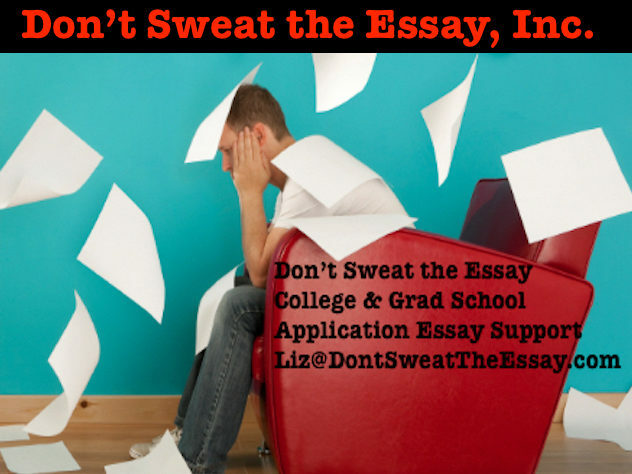 If you need help with your essays at any stage, from brainstorming to final edits, shoot me an email: Liz@DontSweatTheEssay.com – I’m on the East Coast. If this is useful information, please pass it on! Thanks for stopping by.